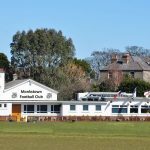 The Club shall be called Monkstown Football Club and hereinafter referred to as the Club. The club exists for the play and encouragement of Amateur Rugby Union Football and for any other activity helpful for this purpose. The club shall be affiliated to the Irish Rugby Football Union and to the Leinster branch of the Union. The colours of the club shall be Blue and Gold, which shall be worn at all matches with white knickers. Neither the name of the club or the club colours shall be changed unless by a majority of three quarters of those present and voting at a General Meeting. The club crest shall consist of the Blazon Arms of Dun Laoghaire comprising Purpose the base wavy of nine azure and argent on the dexter of a grassy Headland, an embattled stone tower and on the sinister a Viking galley with Sail set all proper. A chief per pale of the third and vert, on the dexter an Ancient mitre of the fourth and on the sinister an antique crown. The business and affairs of the club shall be under the management of an Executive committee elected for a period of not less than one year. The club and its members in all their activities shall respect the rights, dignity and worth of every human being and their ultimate right to self-determination. Specifically, the club and its members shall treat everyone equally regardless of gender, marital status, family status, sexual orientation, disability, age, race, religious beliefs, membership of the Travelling community or political persuasion and shall promote equality of opportunity. The club and its members are deemed to have assented to abide by the Irish Rugby Football Union Code of Conduct for the protection of children and as such agree to adhere to the principles and responsibilities embodied in that code. The property of the club shall be vested in not more than three Trustees and the current Trustees under the former rules of the Club rescinded by the adoption of these rules shall continue to be the Trustees. The Trustees shall deal with the property of the Club as the Committee may from time to time direct by resolution (of which an entry in the Minute Book shall be conclusive evidence). The Trustees shall be indemnified against risk and expense out of the Club property. The Trustees shall hold Office until death or resignation or removal by the Committee. Where by reason of such death, resignation or removal it is necessary that a new Trustee be appointed, the Committee shall nominate the person or persons to be appointed the new Trustee or Trustees. The Club shall consist of Honorary Life Members, Life Members, Playing Members, Pavilion Members, Student members, Country Members (any members whose permanent address is at least 50 miles from Dublin), Schoolboy Members and Touch Rugby Associate Members. Schoolboy and Touch Rugby Associate Members shall not be entitled to vote at any General Meeting of the Club. Honorary Life Members shall be confined to such persons as are from time to time nominated by the Executive Committee on account of exceptional service to the Club and who are elected at a General Meeting by a majority of at least two thirds present and voting Honorary Life Members shall not be liable to pay an annual subscription. The mode of election of members, other than Honorary Life Members shall be ballot of the Executive Committee at which at least five members must vote and at which a majority of three quarters of those voting shall be necessary for election. Candidates for membership shall be proposed and seconded in writing by members of the Club and the names and addresses of such candidates shall be posted on the notice boarding in the Club for at least one week prior to their being considered for election by the Executive Committee. The Executive Committee shall have the power to suspend temporarily or to exclude permanently from membership of the Club any member whose conduct shall be deemed by the Committee to have been harmful to the best interests of the Club. Before such action is taken, the members concerned shall be informed of the nature and circumstances of the alleged conduct and circumstances and shall be given an opportunity to appear before the Committee to answer such charges. Players, Substitutes and Officials of any team playing at Sydney Parade against Monkstown XV or teams or team panels using the Club grounds with the permission of the Executive Committee and all referees and touch judges in such matters shall become temporarily Honorary Members on the day on which such a match is played or the ground used. The rate of annual subscription for each category of member shall be determined from time to time by resolution of a General Meeting of the Club. The Executive Committee shall have the power to waive the annual subscription in the case of a member who is temporarily absent abroad. On payment of his annual subscription each member shall receive a membership card for that season and he shall when required produce his card on entry to the club grounds and premises. If a member’s subscription has not been paid by the date determined in each year by the Executive Committee, he shall be liable to have the rights and privileges of Club Membership forfeited and, inter alia, may not therefore be eligible for selection as a player. The Honorary Offices shall be President, Senior Vice President, Junior Vice President, Immediate Past President, Club Captain, Honorary Secretary and Honorary Treasurer. The business and affairs of the Club shall be managed by an Executive Committee consisting of Honorary Officers, together with four members elected annually at the Annual General Meeting. The Executive Committee shall have the power to co-opt additional members of the Club to the Committee and to delegate business to sub-committees if they deem it appropriate. Each Executive Committee meeting shall require a quorum of four. The Honorary Treasurer shall be responsible for ensuring that all proper financial accounts and records are kept up to date and are submitted for audit in due time. A General Meeting shall appoint the Club Auditors. The Honorary Secretary shall be responsible for keeping up to date all Club records and correspondence and for keeping minutes of General and of Executive meetings and its sub-committees. He shall submit to the Annual General Meeting a report of the season then ending which shall include a summary of such matters of management and policy the Executive Committee considers should be reported to the General Meeting and a review of playing achievements, honours gained and Club performance generally. The Executive Committee shall from time to time appoint as they deem fit members of the Club to act as Honorary Assistant Secretary, or as Honorary Assistant Treasurer or as Honorary Assistant Fixture Secretary. The Executive Committee may appoint a member to act as Chairman on the Executive Committee for a minimum period of 2 years. The Executive Committee shall have the power subject to any special direction or resolution of a General Meeting to control and apply the finances of the Club and to incur expense it may considerable desirable in the interests of the Club and to engage, dismiss or retire such Officials or Servants as it may deem necessary. The Committee may from time to time, alter and repeal regulations governing the use of the Clubhouse by Members, admission of guests to the Clubhouse and generally for the good conduct of the affairs of the Club. Such regulations shall, providing they are not inconsistent with the rules of the Club for the time being be binding on all members and be construed as part of the rules of the Club until they are rescinded or varied by the Club at an Annual General Meeting. The Club funds shall be kept in the name of the Club with a Bank appointed by the Executive Committee. Two persons from a panel of four, whose names shall be certified to the Bank by the Executive Committee, shall sign all cheques drawn in the name of the Club. One of these signatories shall be the Honorary Treasurer. The Executive Committee may exercise all powers of the Club to borrow money and to mortgage and charge it’s undertaking and property or any part thereof, whether outright or as security for any debt, liability or obligation of any third party, provided that prior to doing so, the Executive Committee refer any proposal for the provision of such security for any third party borrowings to a General Meeting of the Club and approval being obtained at such General Meeting for the proposal. A General Meeting of the Club (to be called Annual General Meeting) shall be held in the month of May on such date as shall be determined by the Executive Committee provided that notice of the date is sent to each member entitled to attend at least fourteen (14) days before the meeting together with notice of business to be transacted. The quorum of the Annual General Meeting shall be twenty-five members. The Chair shall be taken by the President or in his absence the Vice President or his Deputy, failing which the meeting shall elect a Chairman. The Chairman shall have a casting vote. The election of Honorary Officers and any other Officer holders required to be elected at a General Meeting. Consideration, and if thought fit, adoption of the Honorary Secretary’s Report and the Honorary Treasurer’s Report and the audited accounts made up to 31 March. The appointment or re-appointment of Auditors and such other business as may be transacted at a General Meeting of the Club. Where a General Meeting for any reason fails to elect or appoint an Honorary Officer or Office Holder, that meeting may by resolution delegate to the Executive Committee to proceed to such election or appointment. No motion may be set before a General Meeting unless notice of the motion in writing is received by the Honorary Secretary at least forty-eight hours in advance of such meeting. The Honorary secretary shall convene a Special General Meeting if he is directed to do so by the Executive committee or if he has received a request in writing, signed by at least fifty members, which must state exactly the proposal, which they intend to submit to this meeting. Every member entitled to attend must be given at least fourteen (14) days notice together with the precise details of the intended Resolution. Discussion at such meeting shall be confined to the business specified in the notice. No member of the Committee and no Manager or Servant employed in the Club shall have any personal interest in the sale of excisable liquor therein or any profits arising in such sale. A visitor shall not be supplied with excisable liquor in the Club premises unless on the invitation and in the company of a member. Such Member shall upon the admission of such visitor to the Club premises, or immediately upon his being supplied with such liquor enter his own name in a book kept for that purpose and which shall show the date of each visit. No excisable liquor shall be sold or supplied to any person under eighteen years of age and no excisable liquor shall under any circumstances whatsoever be supplied for consumption off the premises of the Club. At any time on Christmas Day or Good Friday. On any other day, as specified hereunder, outside the times so specified in respect of it. St Patrick’s Day: between 12.30pm and 12.30am on the following day. The 23rd December: if it falls on a Sunday, between 10.30am and 11.30pm. Christmas Eve and the eve of Good Friday: between 10.30am and 11.30pm. The eve of any public holiday (other than Christmas Eve). If it falls on a Sunday, between 12.30pm and 12.30am on the following day. Any other Sunday (except St Patrick’s Day which falls on a Sunday) between 10.30am and 11.30pm. Any other Monday, Tuesday, Wednesday or Thursday: between 10.30am and 11.30pm. Any other Friday or Saturday: between 10.30am and 12.30am on the following day. A drinking up time of thirty minutes after such hours applies during which entertainment is prohibited. A child (a person under the age of 15 years) accompanied by his parent or guardian may be in the bar of the Club premises between opening time and 9pm. The above does not apply if it appears to the licence holder that the child’s presence in the bar could be reasonable regarded as injurious to his/her health, safety or welfare. A person who is aged at least 15 years but under the age of 18 years may be in the bar of the Club premises between opening hours and 9pm. A child (a person under the age of 15 years) who is accompanied by his/her parent or guardian or a person who is aged at least 15 years but under the age of 18 years may be in the bar on the occasion of a private function at which a substantial meal is served to persons attending the function. The Staff and Officers of the club have an absolute discretion to require any person entering or on the premises of the Club to present a formal document of identification (for example: driving licence or passport) to refuse entry to any person (including a person under 18 years of age) to refuse to serve with intoxicating liquor and to require any person (including a person under 18 years of age) to leave the premises whether this be by reason of that persons disorderly conduct, drunkenness or otherwise. The Executive Committee shall have the power to alter or add to Rule 7 for the purpose and for the purpose only of complying with the Registration of Clubs (Ireland) Act 1904, of the intoxicating Liquor Act 1960 or the Intoxicating Liquor Act 2004 or any other Act of the Oireachteas which may be passed amending the said Acts. Notice of such additions or alterations shall be posted forthwith in the Club premises. For the purposes of this Rule 8 the word ‘Officer’ shall mean an Honorary Officer or a member of the Executive Committee of the Club from time to time referred to in Rule 5. Reasonable and proper remuneration to any member of the Club (not being an Officer) for services rendered to the Club. Interest at a rate not exceeding 5% per annum on money lent by any officer or another member of the Club to the Club. Reasonable and proper rent for premises demised and let by any member of the Club (including any Officer) to the Club. Reasonable and out-of-pocket expenses incurred by any Officer in connection with his/her attendance to any matter affecting the Club. Fees, remuneration or other benefit in money or money’s worth to any Company of which an Officer may be a member holding not more than a one hundredth part of the issues share capital of such Company. If upon the winding up or dissolution of the Club there remains, after satisfaction of all its debts and liabilities, any property whatsoever, it shall not be paid or distributed among the members of the Club. Instead such property shall be given or transferred to some other institution or institutions having main objects similar to the main objects of the Club. The institution or institutions to which the property is to be given or transferred shall prohibit the distribution of their income or property among its or their members to the extent at least as great as is imposed on the Club under or by virtue of Sub-Rule 8.1 hereof and this Sub-Rule 8.2. Members of the Club shall select the relevant institution or institutions at or before the time of dissolution, and if and so far, as effect cannot be given to such provisions, then the property shall be given or transferred to some charitable object. This Rule 8 is in force and binding on all members as from 2009 when a Special Meeting of the Club adopted this Rule 8 and from which date it replaced the previous Rule 8 of the Club. No new rule or alteration of any rule save except Rule 7 shall be made except by a Special General Meeting summoned for that purpose and subject to the approval in writing by the Revenue Commissioners in accordance with Sub-Rule 8.3 having been previously obtained.